The community learned valuable lessons as it recovered from Hurricane Katrina. During Hurricane Katrina, floodwaters poured from the Mississippi River into the tiny town of Phoenix, Louisiana, ravaging homes, churches, and businesses. 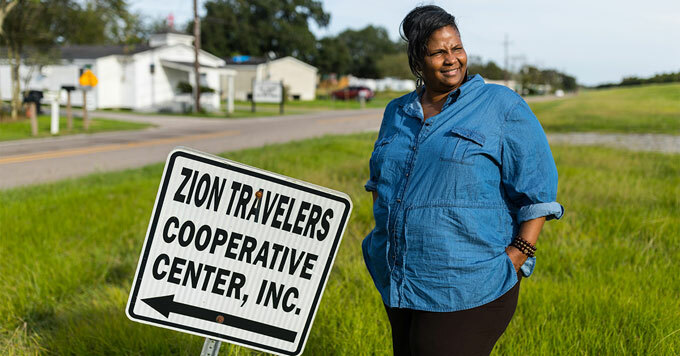 After the storm, community members formed a faith-based nonprofit called the Zion Travelers Cooperative Center. Their work began as a grassroots recovery effort, with neighbors helping neighbors gut houses and remove debris, to prepare for rebuilding. That’s lifelong resident Darilyn Turner, who now directs the center. Today, the group’s work continues. They educate residents about climate change and how rising seas and increasingly intense storms threaten the area. And members advocate for solutions that could help protect them, including wetlands restoration and stronger levees. Turner is realistic about the threats that lie ahead. But she says her community is resilient and will stay put as long as nature – and God – allow. Photo: Courtesy of Darilyn Turner.